The Library exists to provide you with a wealth of books and other reading materials; we have 17,000 resources including books, reference books, magazines, careers information and university guides. You can visit the library before school, break time, lunchtime and after school. It’s important to choose a book that you are interested in – you need to be prepared for Daily Reading Time! Every student in Years 7, 8 and 9 also spends time in the Library every fortnight as part of their English lessons. What is my Reading Range? All students in Year 7, 8 and 9 have a Reading Range. Your Reading Range helps you to select books at the right reading level for you. You don’t want to pick books that are too easy or difficult and this system helps you to choose. Your Reading Range will be a range between two numbers e.g 3.4 – 5.0. If you are not sure about your Reading Range –ask your English teacher. How can I increase my Reading Range? The answer is simple – read, read, read!! There is no better skill for you to acquire and develop than the skill of reading. Over time, we want you to develop a love of reading also, and that is why we have a Daily Reading Time as part of the school day, five days a week. Each day and every day, you are given 20 minutes in which to read and enjoy your chosen book. Your Reading Range will change as your reading improves – allowing you to read a bigger range of books. All students in Years 7, 8 and 9 participate in the Accelerated Reader Programme. This programme is nationally recognised as being one of the best ways to select books suitable for you and your Reading Range. The King’s has invested vast sums of money in making our stock of Accelerated Reader books the best it can be, and we are continuing to add to this stock of books year by year. 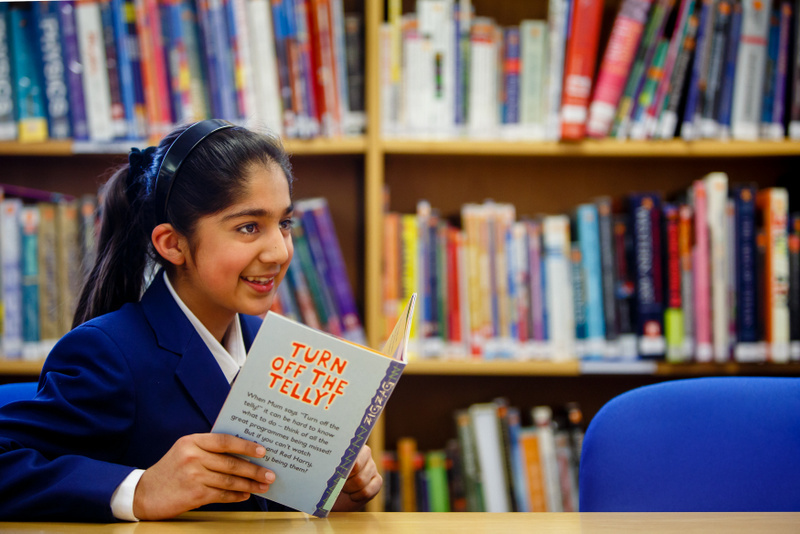 We have over 5,000 Accelerated Reader books so there really is something for everyone! Please do use, read and enjoy the Accelerated Reader books we have purchased. If you want to read a book from home, that’s fine; just check to see if it’s on the Accelerated Reader Programme. Go to www.arbookfind.co.uk and type in the title of your book. Did you know that you can log onto Accelerated Reader from home? Use your Accelerated Reader username and password to log onto your account. You can view your bookshelf and check on your quiz pass rate, points total and book level. The Library stocks a wide range of fiction and nonfiction books, including classic texts and “Quick Reads”. Furthermore, you can borrow DVDs (appropriate to your chronological age!) and you have access to a range of newspapers, magazines and periodicals. Students are welcome to visit the Library before and after the school day, as well as during morning break and over lunchtime. A Library Pass system is in operation to ensure the Library does not get overfull at peak times. There is also a suite of computers provided for you to conduct research and surf the web (with all the usual filters and firewalls in place to protect you). If you have a question that needs an answer, do not hesitate to ask the Library Manager or her team of Student Librarians. They are well trained and highly skilled at pointing you in the right direction to find the answer you are looking for. They will not do the work for you, however – that is your job! Any student who wishes to remain at school to do their homework in peace and quiet is welcome to attend Homework Club, which takes place in the Library each day after school.